When the police want to speak to someone they suspect has committed a crime, they generally either arrest them or invite them in for an interview. When that person is already being held in custody for something else, an application before the Magistrates' Court needs to be made first. be delivered into the custody of the investigating official for the purpose of questioning or investigation in respect of the first-mentioned offence. Case law on the interpretation of this section is not common. Although s 464B (4C) obliges Victoria Legal Aid to provide unrepresented suspects with legal representation, in practice these applications are rarely objected to and rarely refused. In many cases, it's advantageous for the person in custody to have an allegation against them resolved during their imprisonment so that any penalty which might result can be dealt with concurrently. In Wallace v Debs & Anor  VSC 355, the Supreme Court considered what was meant by offence under s 464B(1)(b). Victoria Police Detective Jason Wallace applied in October 2008 to interview Bendali Debs about the murder of a woman in Sydney in 1995. Debs is currently serving multiple life sentences in Victoria for murder. The application was refused, the magistrate determining that offence in the context of s 464B(1)(b) of the Crimes Act refers only to Victorian offences, and has no extra-territorial application. The police appealed to the Supreme Court. Pagone J found that the magistrate had interpreted the provision correctly. 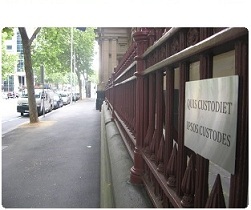 The offence reasonably suspected must be an offence which a court in Victoria would have jurisdiction to hear. Finally I should deal with one argument put against this construction; namely, that the provision would be unworkable if it required establishing Victorian jurisdiction before it could be invoked. In my view, this concern is unfounded. The section may readily be invoked whenever it is "reasonably suspected" that the person to be investigated has committed an offence contrary to the laws of the state of Victoria. In other words, it is sufficient to invoke the provision that the investigating officer has a suspicion capable of being described as reasonable. The investigating officer does not first have to establish that the offence was against the state. Rather, all that the investigating officer need do is that which is routinely done when embarking upon any investigation about the possibility of an offence having been committed in Victoria against Victorian law. The construction adopted by the learned magistrate, which I think to be correct, only excludes from operation of the section that narrow class of cases, of which this is one, where it is conceded that the offence has nothing at all to do with Victoria except the presence in Victoria of the person sought to be interviewed. In this case it is properly conceded on behalf of the investigating officer that the investigation to be undertaken is not for the purposes of investigating a Victorian offence but, solely, to enable the police force of another state to investigate a possible offence against the laws of that other state. That limitation is narrow and, it seems, has not otherwise been provided for. The only conclusion by the learned magistrate concerning that issue, with which I also agree, is that there is no justification to assume that section 464B was intended to cover a situation that has not previously been thought necessary to have been covered. Accordingly, I dismiss the application. I don't think this means the s 464B(1)(b) offence must always occur in Victoria. As we discussed here a couple of weeks ago, there are a number of different ways that offences that occur (at least partially) outside Victoria can constitute a crime here. The difference between this case and the High Court decision of Lipohar v The Queen is that here it was conceded that there was no real connection at all between the state of Victoria and the alleged offence, other than the suspect currently being imprisoned here. I don't understand why Victorian Police wanted to question him over something that happened in NSW? Wouldn't the right way to do this have been to extradite the person back to NSW so that the police their could interview him about the murder? Maybe the court turned the cops down because they thought the they weren't doing it the proper way. Great blog btw. Very informative. This is one of the practical difficulties of life in a Commonwealth. So, the Victorian police were trying to do the application on behalf of their NSW brethren. I reckon it was unnecessary: 464B is a rule of evidence, like all the various rules in Part 3, Div 1, sub-div 30A of the Crimes Act. Corrections Act 1986 s 41 also permits police access to prisoners in custody, but is over-ridden by s 464B. A NSW Court is probably not going to look to a Victorian provision in determining admissibility of such an interview. I say probably because there's no silver-bullet case on this exact point. And...the sorts of allegations involved when police travel interstate are usually quite serious. In the absence of clear legislative or judicial guidance, the police will err on the side of caution to minimise the chance of having any interview excluded.